All blueberries are superfoods, but wild blueberries, pack a much bigger nutrition punch than your typical cultivated blueberry. They even taste better! 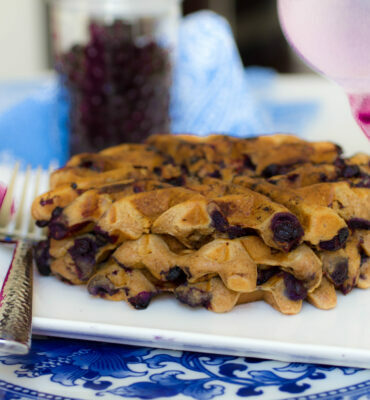 Wild blueberries are smaller in size and they actually stay whole when you cook them, which makes them perfect for recipes such as Blueberry Waffles, Blueberry Pancakes, and Blueberry Custard. Wild blueberries also make the absolute best blueberry muffins! Small but mighty, wild blueberries have more total antioxidant capacity (ORAC) than almost all of the typical fruits and vegetables you see at the grocery store and they have a considerably higher ORAC value than their bigger cousins, cultivated blueberries. 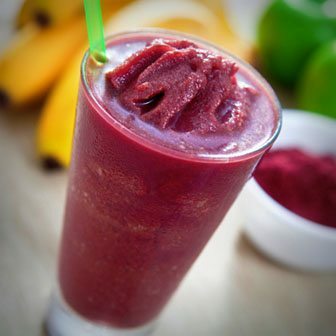 The higher the ORAC value of a food the more powerful that food is at slowing the aging process, fighting disease, reducing inflammation and preserving health. Unless you live in Maine, Atlantic Canada or Quebec, chances are that your local supermarket probably will not regularly stock fresh wild blueberries. So, if you want wild blueberries, you will most likely have to go for frozen. 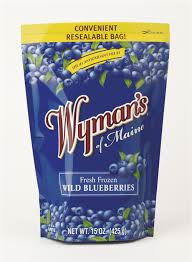 Luckily, Wyman’s sells frozen wild blueberries that are wildly available across the country (they even sell them in bulk now in places like Costco!) Within hours of being picked, Wyman’s sorts and cleans their wild blueberries using state-of-the-art technology that preserves flavor, quality and antioxidant goodness. If you have a favorite use for wild blueberries, please tell us all about it in the comments below! Last summer I took my English man picking blueberries in the forest in Sweden. Foraging is very much in our culture. And I agree, wild blueberries taste so much more! I’ve heard that they call them bilberries here in the UK and I’ve never heard if you can get them or pick them here.